The Middle Years Programme is a course of study designed to meet the educational requirements of students aged between 11 and 16 years (grades 7-10). It is designed to include the requirements of the Japanese curriculum and incorporate the MYP’s educational principles and framework. “In the programme model for the MYP, the first ring around the student at the centre describes the features of the programme that help students develop disciplinary (and interdisciplinary) understanding. 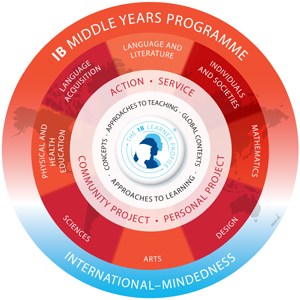 The new MYP model (November 2012) two main circles wherein the circle closest to the centre of the model now contains four elements. Approaches to teaching—emphasizing MYP pedagogy, including collaborative learning through inquiry.